Lean Thinking: Lean/TPS in the Public Service – What are the Obstacles? 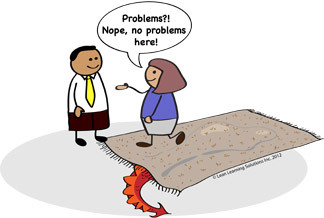 Lean/TPS in the Public Service – What are the Obstacles? In my last blog, I noted that morale in the US and Canadian federal governments is at all-time lows. Moreover, the growing gap between performance in the private and public sector fuels a corrosive cynicism and disengagement – surely the last thing we need nowadays. Why shouldn’t civil servants have the opportunity to develop what Deming called ‘pride of workmanship’? Why shouldn’t they be involved in developing and improving their work processes? Why shouldn’t their work be fun and motivating? Ontario residents are enduring a crippling example of this one. Although energy prices have never been lower, Ontario energy bills have never been higher. In fact, the past decade, Ontario energy prices have tripled, and are now among the highest in North America. Ignoring the advice of industry & government energy professionals, the governing party has repeatedly made ill-considered forays into the notoriously tricky energy market. (Remember Enron?). Overall cost will exceed $ 30 billion, or $ 30,000 per resident. Needless to say, the Ontario economy is blighted. In Lean/TPS terms, the governing party has jumped to countermeasures to an ill-defined problem, and made a mess. Pity the poor government engineer, manager or executive working to develop rationale countermeasures to clearly define problems! Rule 2 of Lean/TPS states that ‘customer-supplier connections must be direct, binary and self-diagnostic’. Such connections drive improvement in the private sector and sometimes contribute to it in health care and education. Our Toyota plant (TMMC) had abundant feedback through multiple sources including organizations like J. D. Power, and our 3/6/9 month in service audits. My dad’s legendary restaurant, The Imperial Grill, also sought and received direct, frequent & binary customer feedback. Do government organizations have the same? I invite our readers to share their thoughts on countermeasures. I’ll mull it over too.